According to The Next web, a leading site about technology, innovations and culture, Groningen has the world premiere. Nuvopos introduced in October 2013 the ability to pay with Bitcoin into their pos system for the hospitality industry. This mobile payment method is now a standard feature within the Nuvopos Point-of-Sale system. Bitcoin Café launches NUVOPOS: the world’s easiest point of sales system with seamless bitcoin integration. October 18th 2013, Groningen, The Netherlands. Paying for a beer at the EMG FAKTORS bar has never been so easy: Order it, scan the QR code on a screen at the bar, and pay in bitcoins with the wallet installed on your smartphone. No bank is involved, the money is transferred directly from the customer to the bar owner. The webbased NUVOPOS app offers a fully featured point of sales system with seamless bitcoin integration, which is unseen before. On Thursday night, dozens of entrepreneurs as well as owners of bars and restaurants welcomed the launch of the NUVOPOS system and a mobile Bitcoin ATM at the Bitcoin Café Groningen in the EMG FAKTORS bar in The Netherlands. 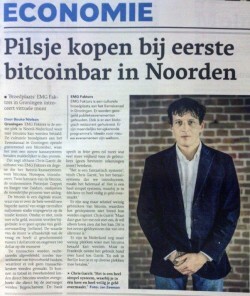 The NUVOPOS system follows three steps: first, the bartender, chooses Bitcoins as means of payment. On a screen at the customer’s side of the bar, a receipt including a QR code appears. After the customer scans the code and confirms the payment with his Bitcoin Wallet, the transaction is completed within a few seconds. In case a Bitcoin payment is requested, the pos-app sends the wallet name of the customer together with the Bitcoin addresses of the restaurant owner and the check amount to the NUVOPOS cloud server.The server then verifies the data and makes the calculation between the amount in the specific currency and Bitcoins. The NUVOPOS app runs on all mobile devices, including iOS, Android and Windows Phone. The video gives you a insight vieuw of the integration of bitcoin payments within the Nuvopos point-of-sale system. At this point, pretty much everyone I talk to on the subject of Bitcoin adoption agrees on one thing: that one of the major challenges, if not the single largest challenge, in getting more merchants to accept Bitcoin is that of usability. We need to develop tools to make it easier for merchants to accept Bitcoin and, furthermore, we need to develop tools that actually showcase Bitcoin’s strengths when compared to traditional payment systems. and process the payment immediately – not taking their credit card and bringing it back two minutes later, but actually immediately, with no hardware except for a generic $ 200 tablet. The potential that these kinds of technologies can bring for restaurants, coffee shops and in-person payments in general underestimated. 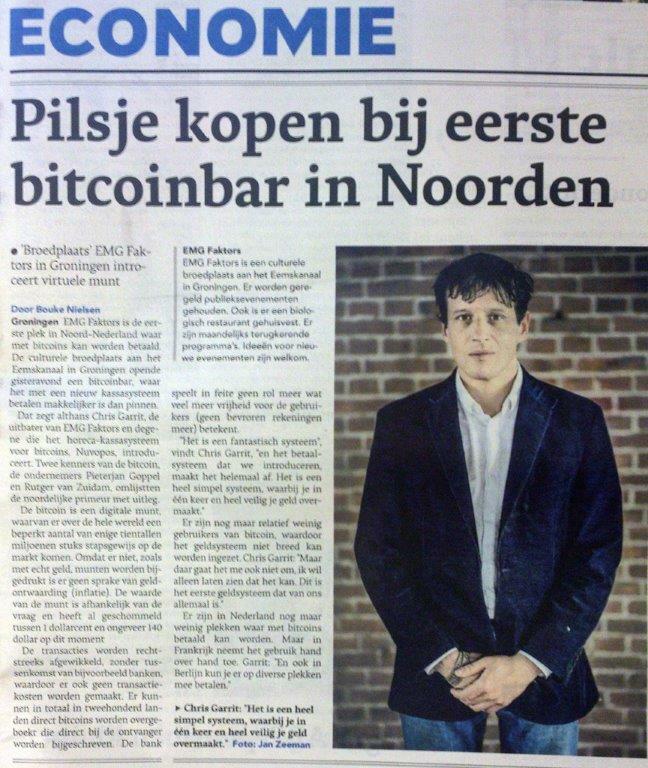 Article in the newspaper ‘Nieuwsblad v/h Noorden’ integration bitcoin payment within pos system.